The company slogan change, from "Smarter Choice" to "The future is fusion" marked a major shift in core-Strategy for AMD. The company now focuses on delivering solutions, more so than mere products, with a solution comprising of several products working together to let the PC serve a purpose. One such solution is the AMD Maui entertainment platform. Maui platform makes AMD hardware work with AMD's own Live! Media Center software to deliver a complete home-theater PC solution. On the hardware front, Maui includes a qualifying AMD Athlon X2 or Phenom series processor, a motherboard based on the AMD 7-series chipset with integrated graphics. Video is handled by the 7-series IGP, while audio is handled by a special audio component-riser card that has pre-amp circuitry onboard, which enables users to connect speakers in the 5.1 channel configuration directly to the motherboard. Future models would bring in 7.1 channel support. 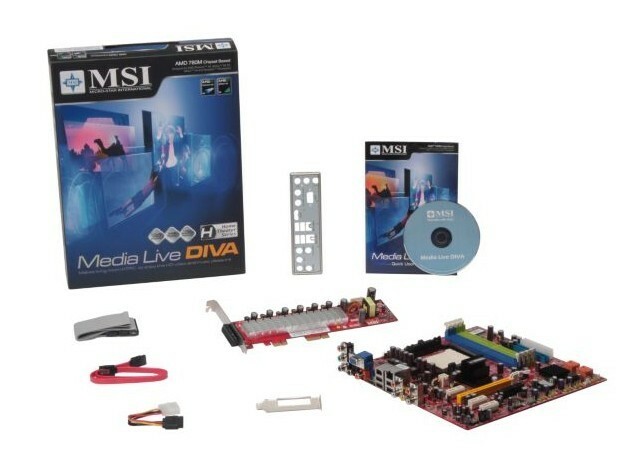 The first motherboard to use this design, is the MSI Media Live DIVA 5.1 780M. 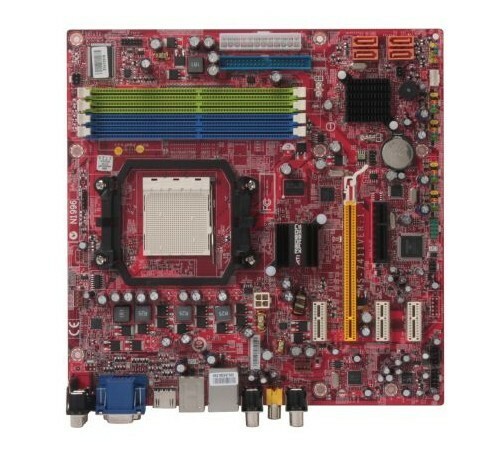 This motherboard uses AMD 780M + SB700 chipset, it features all HTPC related connections right on the board, in a M-ATX form factor. 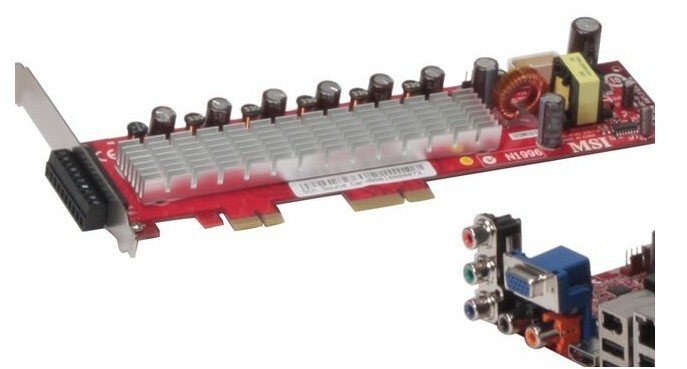 Right below the PCI-Express x16 slot, is a PCI-E x1 slot with some connections towards the end of the card, which route audio and power to it. The large heatsink cools the pre-amp circuitry, and the card ends up in direct wire-leads. For convenience's sake, there's a low-profile bracket bundled. The board provides D-Sub analog display out, along with audio-routed HDMI, and HDTV composite RCA connectors right on the board. The motherboard is selling as combo-bundles on Newegg.com, which include the board along with a range of available AMD processors. The board itself is priced at $185. It includes AMD Live! software. Bundles start at US $279, which packs a Phenom X3 8450 along, going all the way up to a $349 bundle with a Phenom X4 9750. There's a bundle including a low-power Phenom X4 9350e, priced a notch higher at $350. The list of bundles can be found on Newegg's American website here. very cool idea! i wonder how 780M is different from 780G? It's the low-power variant of 780G, to be used in Turion Ultra notebooks. Same levels of IGP performance. I don't see "a digital TV tuner on the motherboar" or a physical way to access said digital tuner. Edit: you're right, there is no tuner component to this board although Maui specifies. Thanks. so can this do Dolby TrueHD and DTS HD 5.1 too? Looks more like a capacitor forest ! Perhaps a digital tuner was included in an AMD reference design / spec for the Maui Platform but partners like MSI were free to deviate from the spec in favor of thier own design? Sadly no, but the audio is HDCP capable, no problems with Blu-ray/HDDVD playback. Yes, it could also have something to do with AMD breaking away its DTV division to Broadcom, very recently. why would anyone take the 8450 bundle? for $1 more you can get a 65W quad core at 2.0. or you can get a triple core 95W at 2.1. the choice seems obviously to me. Blegh to the whole layout and scheme of the board. However, its all about Home Entertainment these days though they should have just used the 780g, lowered the power consumption. Man that 780m must use a LOT less power that the 780G. I have a fairly big NB heatsink on my board and it still sits at 100c!!!! That HS on the msi board is tiny..
All that aside, I think it would make a nice htpc setup. I still believe that intel has much better power managment and sleep functions than amd which is also important in a media setup. Man that 780m must use a LOT less power that the 780G. I have a fairly big NB heatsink on my board and it still sits at 100c!!!! Perhaps I can shed a little insight on this board. I was a consultant on the team that helped spec out this board. My post here is to provide a little info about this board and the thought process behind it. I do work in the industry, but I do not work for MSI. The board was designed with the Home Entertainment market in mind. If you look at the specs, you will notice that the legacy PC connectors were removed and replaced with more AV centric connectors. To provide better connectivity to HD displays (DLP, Plasma, LCD, etc), the board supports HDMI, Component Video and VGA. Therefore, regardless of the type or age of your HD screen, odds are this board will have a connection that supports it. It is based upon the 780 family chipset so it supports 1080P, Blu Ray, etc. It also has 128MB of dedicated side port memory for stutter free HD playback, including Blu Ray without the need of a discrete graphics card. A x16 slot was added to allow people to instally a hybrid x-fire card (Radeon 3200-3400 family) or a high end discrete card to make this a gaming HTPC. Typical PC motherboards rely on the typical PC codecs (Realtek, ADI, etc.). While this board does have a realtek codec to support SPDIF, this board also has a codec from D2Audio. D2Audio makes high quality class D digital amplifiers for folks like B&W, Polk, Control 4, Phasetech, Denon, Marantz, etc. This code provides much higher audio quality than traditional PC audio. Signal to Noise Ratio is 105dB or higher, Total Harmonic Distortion is 0.1% or lower. This is similar to fairly expensive Mainstream Amplifers. In additon to this, the audio is very scalable. The motherboards by itself, supports 2.1 RCA line level audio. With one of the add in cards you can take it up to 7.1. Again, these are standard AV style RCA connectors, not 3.5mm mini jacks. This way, if you have a nice amplifier and don't want to replace it, you can easily integrate this into your existing Home Entertainment solution and deliver high quality audio directly to the amp. The board does support Coax SPDIF, but the audio quality over SPDIF does not come close to what you get from the line level 7.1 add in card. Now, if you don't have a nice amp, but want great audio without spending $800 on just an amp, you can install the amplifer card 100/ch. and deliver AVR class audio directly to your speakers. Paired with Vista MCE and you have a high quality very nice, single solution box for your audio and video needs. I have personally set up the 5.1 amp version and the audio sounds simply amazing. Great dynamic range, frequency response. Crystal clear highs, deep booming bass. I use it almost daily. I rent a lot of blu rays and this plays back everything without any problems. The challenge I have seen is that people think of this as another PC motherboard. While it can be used as a fully functional PC, it is really designed to deliver a great entertainment experience in a cost effective manner. Hope this helps provide a little insight and info as to why this board was set up the way it was. How'd you find this site jack? Was just looking for any news updates regarding this platform. Trying to see what people have to say about it. So far, those that have actually built a system around it over at AVS have been surprised by how good the audio sounds on this platform and are very pleased with it. AMD Maui Platform and the build. that thing looks badass! closest thing to an actual "HTPC" that i've ever seen since the idea was first developed i would be pretty sceptical about the built in audio amplifier appraoch though. i have a hard time seeing some proprietary add-on card that small doing what a true a/v amp or a/v receiver can. i'd definately be using the 7.1 pre-amp and other legitimate a/v hardware. however, i really can see how that would be enough to satisfy a lot of people. Would it be worth it to swap my ASUS 780G for a ASUS 780M? I don't have any experience with the Asus board, however here are some things that make this unique and worthwhile. 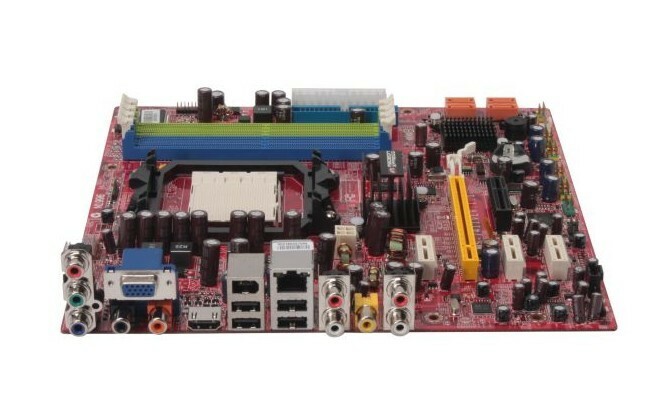 This board has 128MB dedicated sideport memory for improved BD and video playback and 3D Processing. This is not found on too many IGP boards. This board has D2Audio's DAE-3 DSP for outstanding audio performance. Way better audio than traditional PC codecs. True AVR class audio performance. Unique back panel I/O. Board was designed for HTPC, no 3.5mm audio jacks. No PS2 keyboard/mouse, no serial or parallell ports...just lot's of AV centric connections for easier hook up to TV and audio devices. As for the amp card, again, I can tell you personally that this thing sounds AMAZING. I have personally built over 100 of these systems now and have the amp version in my own home. I would stack it up against mainstream AVRs up to 1K in price, no problem. It may not have the same, super high wattage output, but you don't need it because it is class D, 93% efficient. This means 93% of the power coming into the card, goes out to the speakers. Audio is crisp, clear and has plenty of punch to drive my theater room. I am connected to Infinity Primus speakers in front and Difinitive Pro Studio's for surrounds along with a 10" Polk sub. I can crank it up and hear it clearly in any room in my house. It is more pricey than other 780 boards, but the audio you are getting with it is beyond what you can get out of other boards. 3rd party content aggregator. Lots of original programming and syndicated rerun stuff along with some movies.